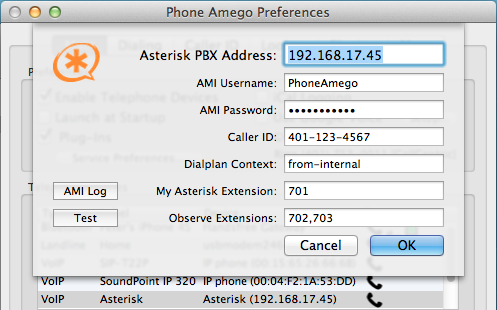 Phone Amego 1.4.16 or later includes support for phones connected to an Asterisk PBX. Asterisk supports virtually any standard SIP phone offering tremendous flexibility. You can get on-screen Caller ID, call logging, dial, end call, mic mute, dial an extension, or send touch-tones. Phone Amego uses the Asterisk Management Interface (AMI) to dial and receive call events. You will need to specify the IP address of your Asterisk server and AMI login credentials. In general, AMI should not be exposed to an untrusted network outside your firewall or NAT gateway. You must also specify a dialplan context for dialing. In Asterisk, a "context" is simply a label that identifies where to begin executing call handling instructions. For dialing from an internal extension, this will usually be "from-internal" or "default". Finally, you must specify your Extension for dialing, and any other Extensions you wish to observe (for caller ID). You can add multiple Asterisk servers, or additional instances of the same server to dial from more than one extension. By selecting "Prefer Multi-line Call Status" under the Caller ID tab, you can see a Window showing the status of any extensions you are observing. The AMI Log button opens a window showing the complete data exchange with your Asterisk server. The Test button can be used to verify your login credentials. With Asterisk, it is possible to have multiple phone numbers that ring the same extension. Double clicking on the Asterisk entry in the Telephone Devices table will display an options dialog that includes Show inbound number that was called. When selected, this option will show the Caller ID => Callee ID in the HUD window. An answering service might use this feature to identify which number was called.